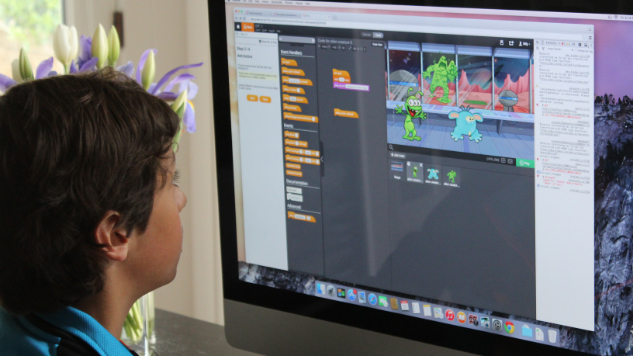 Tynker’s subscription-based service has made it easy and fun for kids all over the world to learn the basics of coding. Having recently announced two new courses, Space Cadet and Dragon Spells, the platform is supporting the Everyone Can Code program from Apple. The thinking is that it’ll allow students to seamlessly transition to the Swift programming language within the Tynker app. It’s an ideal set of stepping stones for the aspiring young coder, and ripe for encouraging youngsters to get involved with STEM subjects. We talked to Tynker co-founder and CTO, Srinivas Mandyam, to find out more about the platform, the firm’s vision and the importance of keeping kids interested. As he points out, one scenario could have students programming a dragon in order to get past obstacles and collect treasure. While it might sound like a regular game, it’s teaching them fundamental programming practices such as functions, variables and loops. Engagement is key, notes Mandyam: “We believe that project-based learning that draws on students’ interests is incredibly powerful.” Where Tynker helps is through its flexibility. Fans of games can code their own, learning about physics along the way, while movie buffs can create their own animations or storytelling projects. It’s a potent mixture of art and science, with the hope being it’ll appeal to all kids with a hint of imagination under their belt. With plenty of studies demonstrating the importance of education through play, from LEGO robotics to Minecraft modding, it’s clear that Tynker has a good plan in mind. They’re also acutely aware of potential challenges involved, especially when it comes to appealing to girls who continue to face undue social stigma in tech classes. A recent study conducted by Microsoft demonstrated what a significant issue it is, and Mandyam and Tynker hope to change such attitudes. “Tynker reaches girls as early as kindergarten, showing them that coding is fun, accessible and creative, and giving them the confidence to pursue coding if it interests them,” explains Mandyam. Besides learning how to code and the logic behind it all, girls learn that they can code, despite stereotypical views, and that they have something to contribute. Tynker supports Minecraft and Minecraft: Education Edition, allowing kids to use the tools to mod their world while also learning key coding concepts. Because, after all, what’s better than learning without even realizing you’re doing it? With coding becoming an increasingly vital tool in anyone’s arsenal, it’s unsurprising to see that more than 50 million kids have used Tynker to start learning the fundamentals. The future is looking very bright for kids keen to use their imagination via computers, as well as the makers of such creative tools. Tynker is available via a number of different plans. A quarterly payment will cost you $16 a month, with a yearly plan working out as $8 a month. Lifetime memberships are also available for a one time payment of $200.